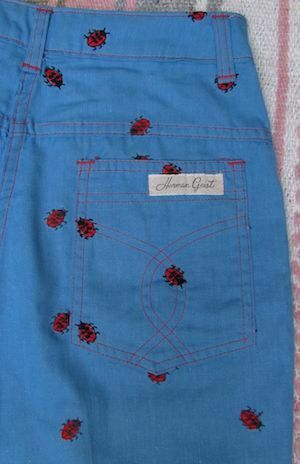 (27x26) Adorable 'Herman Geist' WOMENS Pants, Light Blue w/ Embroidered Ladybugs!! 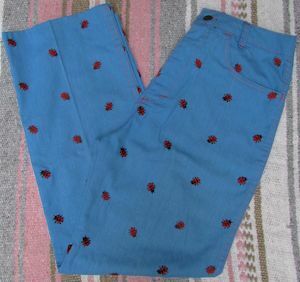 Home > Womens Vintage Clothing > (27x26) Adorable 'Herman Geist' WOMENS Pants, Light Blue w/ Embroidered Ladybugs!! 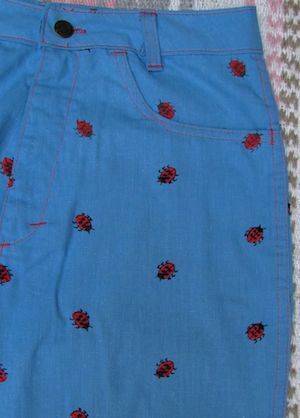 Womens Vintage 60's/70's Herman Geist Pants! 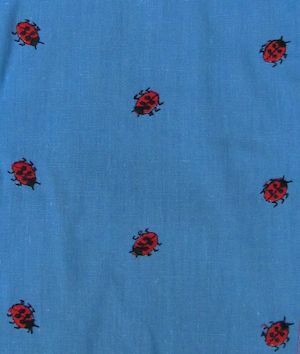 Fantastically Cute: Lighter, Dusty-Blue with Bright Red top-stitching and little embroidered Red and Black LADYBUGS All Over! Brassy Button Closure says "Herman Geist", with a hidden Blue zipper. Two classic pockets in the front, one with a 'change' pocket, and two Patch pockets in the back with cool topstitched designs. No Material tag, but looks a but like Linen, possibly Cotton.